Home > Blog > Spray Foam > Why Spray Foam Roofing? Spray Polyurethane Foam (SPF) is one of the most cost-effective and sustainable roofing, insulation and waterproofing systems available on the market today. Both lightweight and durable, spray foam can increase the structural strength of airplane wings and can be used from everything from a floating dock for sea-going barges to storage containers, shipping containers, and insulation for walls, ceilings, attics and basements. And don’t forget the roofing and construction industry. 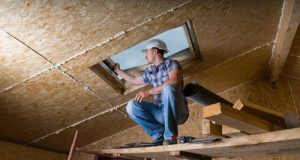 Because it is composed of billions of closed cells, spray foam acts as an air barrier, reducing moisture infiltration, one of the leading causes of building deterioration. Why Use SPF on Roofs? SPF roofs last indefinitely and have the ability to hold their insulation value, well, forever. They withstand extraordinary weather events, one of the main reasons why SPF was selected for the new roof on the Louisiana Superdome. And when compared to other roofing systems with the same R-value, slope considerations and warranty, SPF roofs are typically more economical. In fact, when the life cycle costs of all roofing systems are compared, spray foam is by far the most economical choice by a massive margin. Can be applied quickly with little or no disruption to a facility. Requires fewer crew members during application process, reducing the potential for accidents. Removes the need for multiple levels of roofing required by conventional systems. Produces energy savings of up to 30 percent compared to alternative roofing systems. As the cost of energy increases, so will the demand for SPF roofs. Intech Equipment & Supply is an industry leader in foam roof spraying equipment. Contact us for more information.